The three-part Spectacular Spider-Man “Goblins at the Gate” arc which ran in issues #259-261, is the comic book equivalent of the Wrestlemania 18 showdown between Hulk Hogan and The Rock. 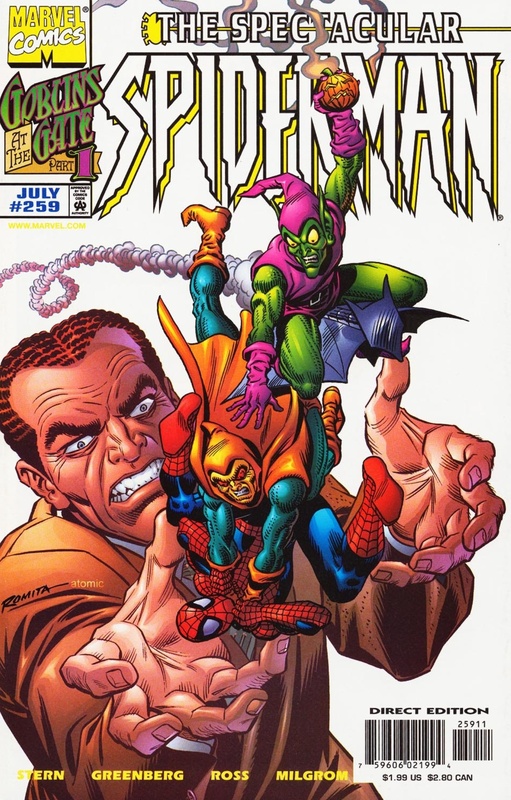 In these three issues – which also function as a postscript to the Roger Stern/Ron Frenz Hobgoblin Lives miniseries – readers finally get the much hypothesized (for Spider-Man fans at least) dream match between the “original” Green Goblin, Norman Osborn, and the “original” Hobgoblin, Roderick Kingsley – except Osborn’s role is limited by the fact that he no longer (publicly) rides around as the Green Goblin, and Kingsley had been so far gone from the public consciousness before Stern resurrected him for Hobgoblin Lives. The end result is an entertaining spectacle, but one that also feels slightly diminished by the wonky circumstances surrounding it. Stern provides the co-plots for the arc, but the script is handled by Glenn Greenberg, who I know from conversations I had with him, takes great pride in his role on this story. 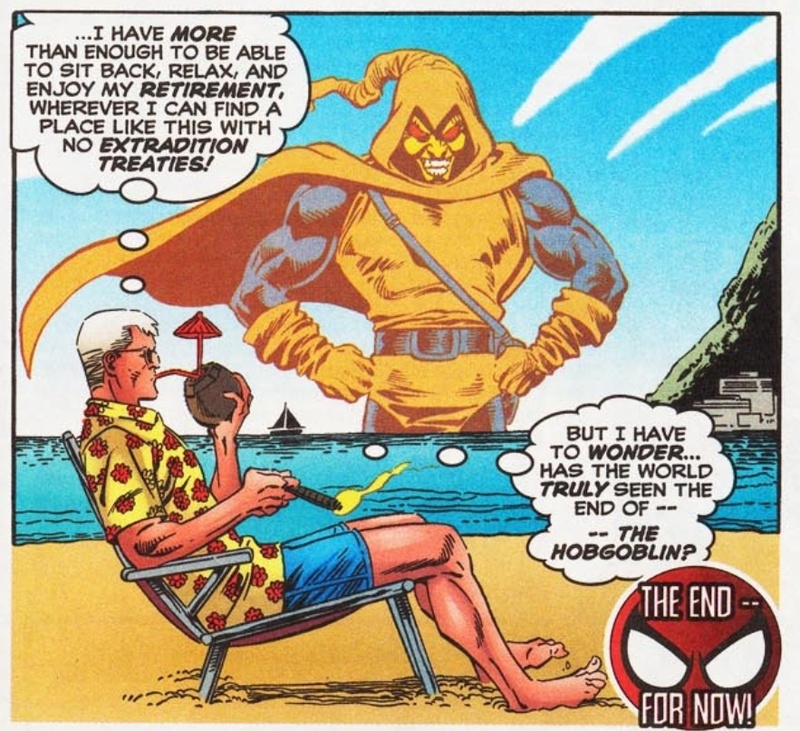 When Stern first introduced the Hobgoblin in the epic Amazing Spider-Man #238, he was presented as a successor to Norman’s Green Goblin, who had been dead for years after the events of ASM #122. 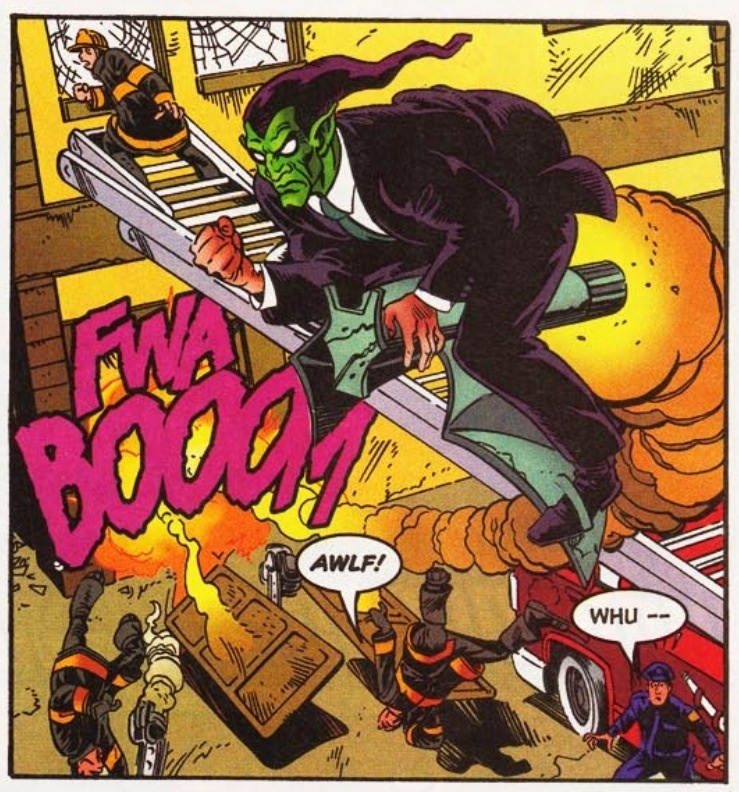 Behind-the-scenes drama botched Hobgoblin’s eventual reveal, so when Norman was eventually resurrected during the “Revelations” arc, gave the Goblin/Goblin showdown new life, but like Rock/Hogan, how much of a bigger deal would Kingsley/Osborn have been if this story was somehow pumped out when both characters were at the peak of their popularities? Not that any of this should be held against the arc’s creative team. The only reason I left this storyline off my upcoming “Top 10 Green Goblin Storylines” list, is the fact that the focal point of Greenwald’s script is more Kingsley, operating in his first full story after the Hobgoblin Lives retcon. Meanwhile, Norman never dons the Goblin costume in this arc (well, that’s not technically true. In a funny bit at the end, he throws the mask on over his business attire in order to hide his identity from authorities). So maybe if I ever do a “Top 10 Hobgoblin Storylines” list on Chasing Amazing, I can rank “Goblins in the Gate” for that one. So with all of my inane justifications explained away, let me spotlight a couple of things that I enjoy about this arc. For one, I really like Greenwald’s set-up for how he goes about bringing Kingsley and Osborn together. 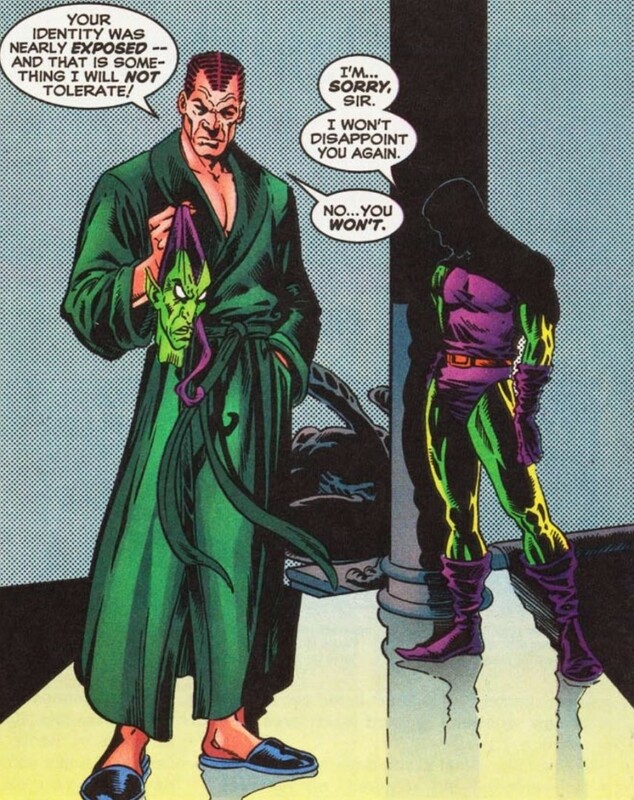 Osborn is busy being the most popular guy in the world (much to Peter Parker’s chagrin) while Kingsley is rotting away in a prison, seething that he was caught by Spider-Man. 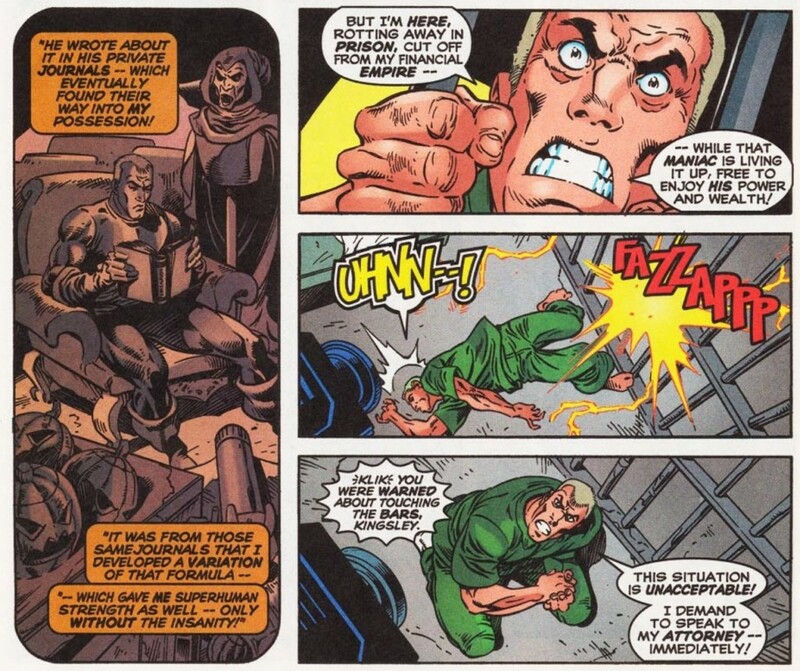 Kingsley sees Osborn kissing babies and being portrayed as a hero, so he decides to do what he always did best as the Hobgoblin – blackmail and manipulate Osborn in a way that will free him from prison. There are some little character moments in the arc’s first issue, that effectively drive home the “Roderick Kingsley is the Hobgoblin” premise – things we don’t get in Hobgoblin Lives by virtue of the fact that Stern saved his reveal of the villain’s identity for the every end of the series. Like how Kingsley – portrayed in some of his earliest appearances as a bit of a priss and a prima donna, complains about his shackles and electrified bars as the prison guards laugh in his face. 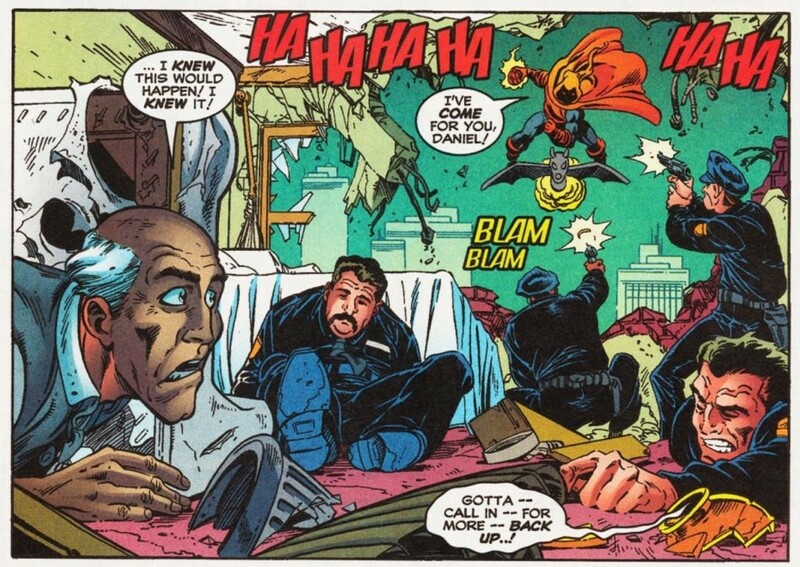 It’s a fun callback to the character’s roots, while also helping to define what the Hobgoblin is like under the mask. Since Kingsley sees himself as a powerful and proper businessman, it’s only fitting that he would balk at what is otherwise, a sensible way to imprison a homicidal maniac with super strength. 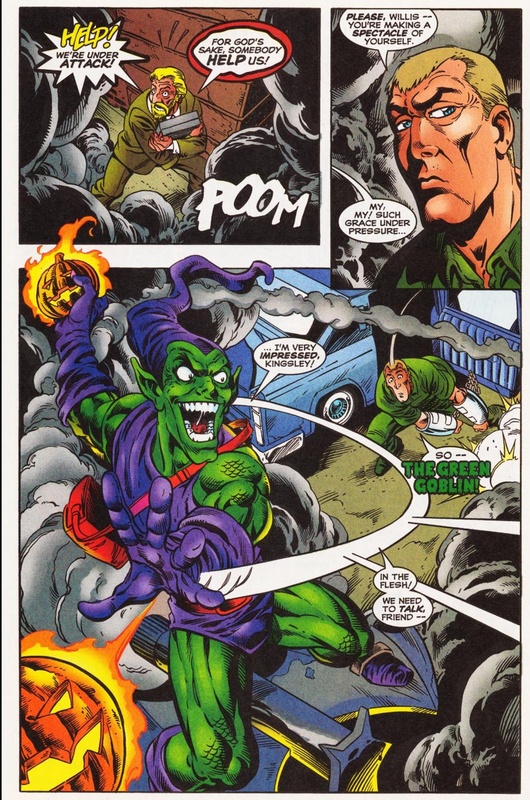 Kingsley threatens Osborn by saying he still owns one of his mythical journals that would out him as the Green Goblin. Kingsley wants his lawyer to bait the D.A. with this journal in exchange for his freedom. 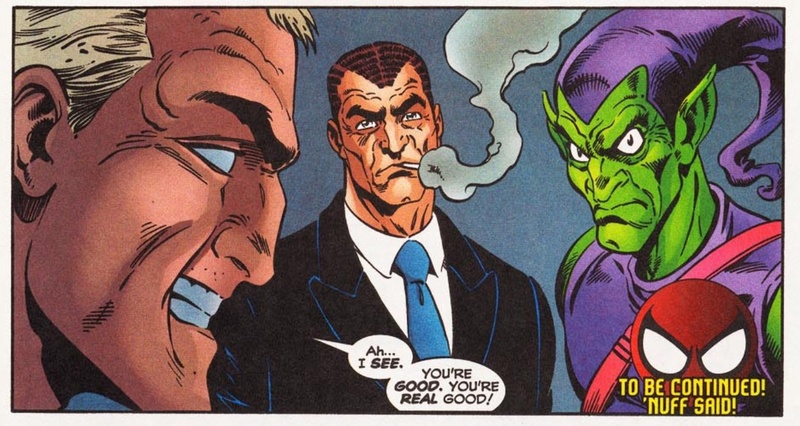 Osborn, of course, is having none of this, and uses his subordinates, including one dressed as the Green Goblin, to take down Kingsley as he’s being escorted out of the prison complex. Kingsley manages to evade death, and hitches a ride on the Goblin’s glider before finding himself nose-to-nose with Osborn. When Kingsley realizes how he was just played by Norman, he can’t help but give him some credit. In the midst of all this Kingsley/Osborn drama, Spider-Man is around, but never have his efforts felt so futile. It’s not that I don’t want to see Spider-Man save the day, but the backbone of “Goblins at the Gate” is the Osborn/Kingsley blood-feud, which Greenberg captures perfectly. 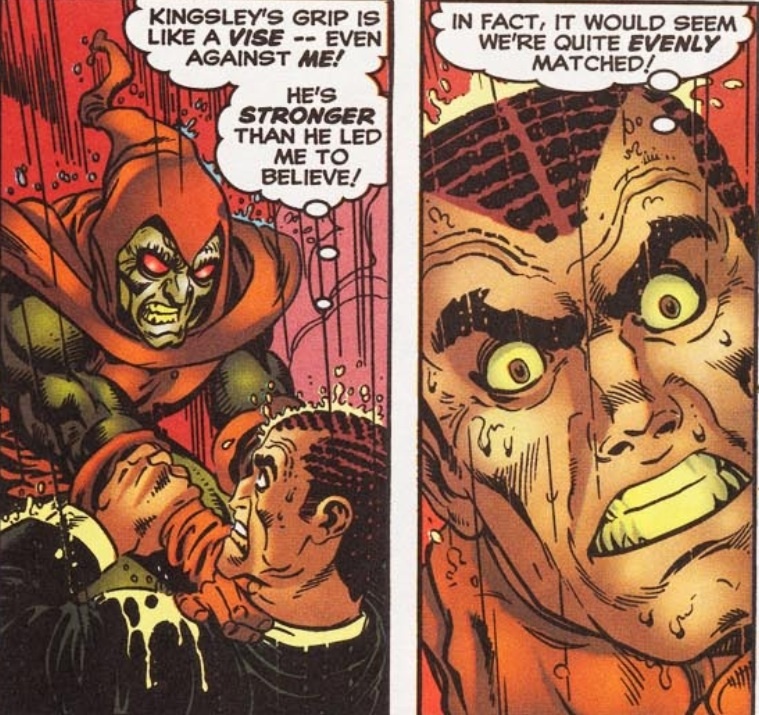 Osborn sees Kingsley as a pretender to his throne, and Kingsley thinks Osborn is an unhinged sociopath. And whether by accident or not, the way Greenberg portrays Kinglsey throughout this story, I’m definitely pulling for the Hobgoblin here. “Goblins at the Gate” also manages to effectively work in Roderick’s (not a twin) brother Daniel, who is currently in a witness protection program of sorts –at least a poorly run one – when Roderick and Norman hijack him to get the whereabouts of Norman’s journal. From this point on, Norman and Roderick engage in the ultimate battle of mind games and one-upmanship, as we discover that Osborn’s journal never actually exists (Norman effectively calls the bluff here), and in return for the attempted blackmail, Osborn brags about how he effectively took over Kingsley’s company (and wealth). And while such bickering between billionaires would be the kind of stuff readers of the Wall Street Journal might find riveting, since Osborn and Kingsley are both super-powered bad guys, they engage in fisticuffs (with the Hobgoblin having the physical advantage over Norman). Oh yeah, Spider-man shows up, interferes in the melee, saves Daniel and then finds a way to rescue a bunch of firefighters by using his webbing to hold up a collapsing wall. But again, and this is not an expression I find myself saying often, who cares about Spider-Man? The storyline does get demerits for teasing another mystery Green Goblin and not effectively resolving it. I understand that the “new” Goblin is supposed to feed into the gamesmanship between Osborn and Kingsley (not to mention another way for Osborn to continue to torment Peter), but as someone who wasn’t even reading these issues at the time they came out but has recently read/re-read a bunch of them in anticipation of my top 10 list, I have to imagine there was a sense of mystery-fatigue from readers. Effectively demonstrating that “Goblins at the Gate” is more Kingsley’s story than Norman’s, Greenberg ends the arc with Kingsley on the beach of a random Caribbean Island, no longer the CEO of his own company, but still living in the lap of luxury thanks to a secret Swiss Bank account. This is effectively the last we see of the Kingsley family until (unless I’m mistaken), Phil Urich kills who turns out to be Daniel, during Dan Slott’s “Big Time” arc in 2010/2011. Greenberg unquestionably provides Kingsley with some closure here, putting a cap on one of the most controversial supervillain back-stories in Spider-Man’s history. Interestingly enough, “Goblins at the Gate” also holds the distinction as being the last Spectacular Spider-Man arc in the title’s history (until it was rebooted in 2003), as the final two issues of the series were crossovers with all the other Spider books. 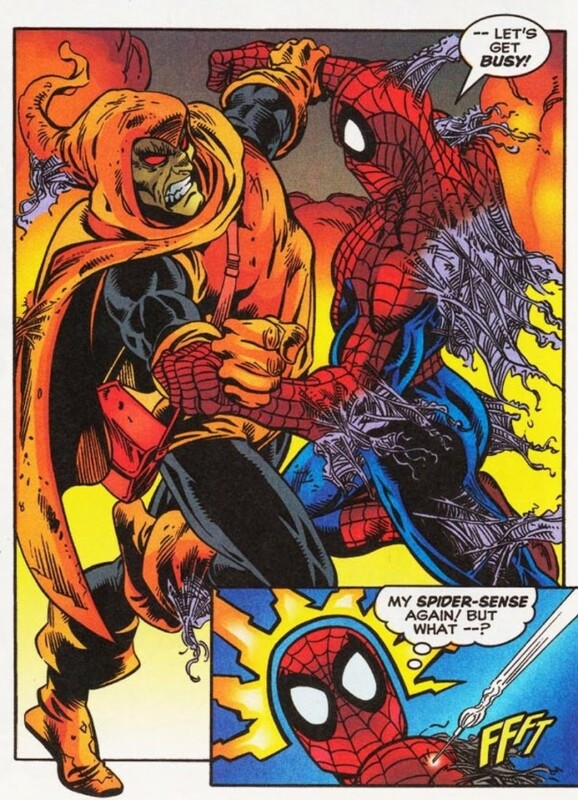 Considering the bulk of the Hobgoblin’s A+ stories transpired in Amazing Spider-Man, I always found it a bit odd that he would be the featured villain that would help close out the Spectacular series, but in terms of quality of content, “Goblins at the Gate” is a nice way to go out. All images from Spectacular Spider-Man #259-261: Roger Stern, Glenn Greenberg, Luke Ross and Al Milgrom. Cover by John Romita Sr. I still remember picking this book up way back in 1998. My dad and I were at our local shop for Superman (It was a huge deal for my dad since the classic red and blues were back effectively ending the electric powers arc.) and while browsing the new issues that glorious Romita cover caught my eye. Ii loved the Hobgoblin from the animated series and I had to have this. Although I was told we were in there for Superman and nothing else, somehow I was able to convince him otherwise and he allowed the 2nd purchase. I remember being so excited to read this book only being dissapointed that Jazzy Romita’s pencils were only on the cover and not the interior art. It wasnt a complete bummer because I was still facinated with the story. I had no idea who this Kingsley was, nor that Osborn guy had risen from the grave. The more and more I read about the two villains the more and more obsessed I became. I still remember highlighting Wizard prices and handing them over to dad while on his runs to maybe pick up a few if he found them and dozens of calls were made to all 4 local comic shops for any Hobgoblin issues. I still remember the day he came home and in a big bag was an assortment of Hobby issues. You have your big box I had my big bag. In it were ASM 245 260-261, 274-275 PPSSM 85 and WSM 38. These comics here started my second wave of Spidey collecting that I think ended after Chapter One finished and the second Amazing Spider-Man run went absolutely nowhere. Although I stopped collecting new issues I did still score through some of the back issues with ASM 131, 141-147, 150-151, 200, 251-252, 289 and many of the clone saga tie ins I could find including Spider-Man 75. It’s funny, after reading Superior Spider-Man #26 I went and reread Hobgoblin Lives and Goblins at the Gate, and then podcasted about both stories on my Comic Shenanigans podcast. And then I happened to check back on your site today and saw this great article that you’ve written about Goblins at the Gate. I still remember loving this story, even though it’s contrived and a little goofy. It holds a special place for me, as does Hobgoblin Lives. Yeah, I remember this story-arc but I was so disappointed that Norman wasn’t in goblin suit to fight Kingsley or that the writers never followed up on Kingsley afterwards before DeFalco and Slott wiped the dust off him. To me I think it was a mistake to not give both Osborn and Kingsley equal treatment as Marvel chose to make Norman into this cliche moustache twirling villain that was reduced to some plot device over the years. As a big Hobgoblin fan, it would have made the spider books more interesting to have both Kingsley and Osborn interract on various occassions but then again Marvel also thought retconning Spiderman’s own marriage was a good idea as well, so it showed how badly written the spider-books were for awhile.